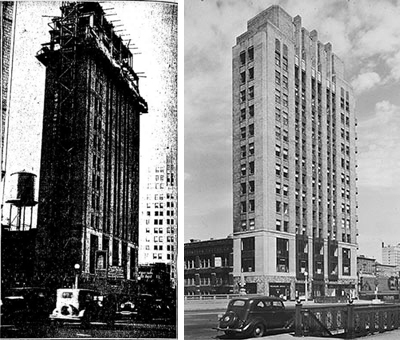 430 N. Michigan building (Silver Skyscraper), later known as the Music Corporation of America building, built in 1929, is 13 stories and one basement high, on pile foundations. Loebl & Schlossman were the architects and Lieberman & Hein the engineers. This was one of the narrowest skyscrapers in the country, with a depth of only 25 feet from Michigan Avenue to its back side. The art deco design gave strong vertical emphasis to the center of the Michigan Avenue façade with continuous limestone piers rising to 3 projecting fins in front of a set-back upper floor. Replaced in 1963 by the Realtor Building, which in 1964 the famous Billy Goat Tavern moved in. Building at 430 North Michigan avenue from which stone, bricks and debris fall into boulevard throngs. A silver skyscraper—perhaps the thinnest ever built—is one of the headliners in the news today. May Be World’s Thinnest Skyscraper. Now to tell about the most spectacular item in today’s list—the fourteen story skyscraper announced for the northwest corner of East Austin avenue (Hubbard Street) and the boulevard. This will be one of the thinnest tall buildings in the world, if not the slenderest. It will be only twenty-five feet deep. Looking at it from the front, it will seem a normal American skyscraper, although more modernistic in its architectural design than customary in new Chicago office buildings. It will have a frontage of 100 feet on Michigan avenue, which will give it an imposing facade. The boulevard motorist or pedestrian, however, will get a shock the first time he glimpses the new skyscraper from either the north or south, The wide, imposing building goes back only tweenty-five feet from the sidewalk. Other Slim Ones Seem Thick. For the person to whom figures mean little or nothing we might call attention to the fact that the 333 building, which seen from Michigan avenue north of the bridge, seems to be and actually is about the narrowest Chicago skyscraper, is almost two and a half times as wide as the “430 North Michigan Avenue building” will be. The 333 tower is approximately 61 feet wide. The Mather Tower, which certainly seems to be unusually slim and tall, is approximately sixty-five feet wide, which is more than two and a half times as wide as the new Michigan avenue skyscraper will be. The Monadnock block, also one of the city’s narrowest tall buildings, is sixty-six feet wide. Loebl, Schlossman & Dermuth are the architects of the new north side skyscraper. They state that work will start within a few weeks, with the expectation of having it ready for tenants by the first of next December. The building will cost $500,000. The 25×100 site is owned by James S. Kirk & Co. and has been leased to the 430 North Michigan Building corporation for ninety-nine years beginning April 1, 1929, at an annual rental of $25,000, or $2,500,000 for the term. Figuring this on a 5 per cent basis, it establishes a record value for upper Michigan avenue—namely: $200 per square foot, or $500,000 for the entire site. The leases have a fifteen year option to purchase the property at any time within the first five years for $555,600; for $626,000 within the second five years, and for $741,250 during the last five years. Now a word about the building’s exterior. It will be of imported marble for the first floor. The second and third floors will be of Indiana limestone. The stories above them will be of face brick, with limestone trim on all sides. The structure has been designed for some unusual night lighting effects. The building, which will be directly across from Tribune Tower and just north of and across Austin avenue from the Wrigley building annex, will be built on caissons. It will have two stories below the boulevard level. The Lundoff-Bicknell company has been awarded the general contract. Paulman & Lawrence will be the renting agents of the new building. Sonnenschein, Berkson, Lautmann & Levinson are the attorneys for the leases. Cutting, Moore & Sidley represent the lessors. The brokers were O. E. Baumbacj of Willoughby & Co. and C. J. Hambleton pf Broomell Brothers. Six upper floors and the lower level of the fourteen story building at 410 North Michigan avenue, directly opposite Tribune Tower, are to he occupied by the Music Corporation of America, it was learned yesterday. This addition to the near north side’s “Radio Row” will take place on Oct. 1 according to W. H. Stein, vice president of the corporation. The property was purchased last February by the Four Thirty company, of which Mrs. Doris J. Stein of Glencoe, wife of Jules C. Stein, president of Music corporation, is the chief stockholder. Since then a 99 year leasehold on which the ground rental had not leen paid for four years has been forfeited to the Four Thirty company, so the latter now owns the entire property. Joseph A. Golde is attor- ney for the company. The Music Corporation of America, which has its main office at 32 West Randolph street, where it occupies an entire floor, will double its space when it moves north of the river. The lower level story at 430 is to be remodeled into audition and rehersal rooms. The corporation books a large part of the radio and dance orchestras of the entire country. It has branch offices in New York, Los Angeles, Cleveland, and Dallas. Karl Krammer is treasurer.